With the Super Bowl coming up, I wanted to share with you my new favorite Skinny Taco Dip! 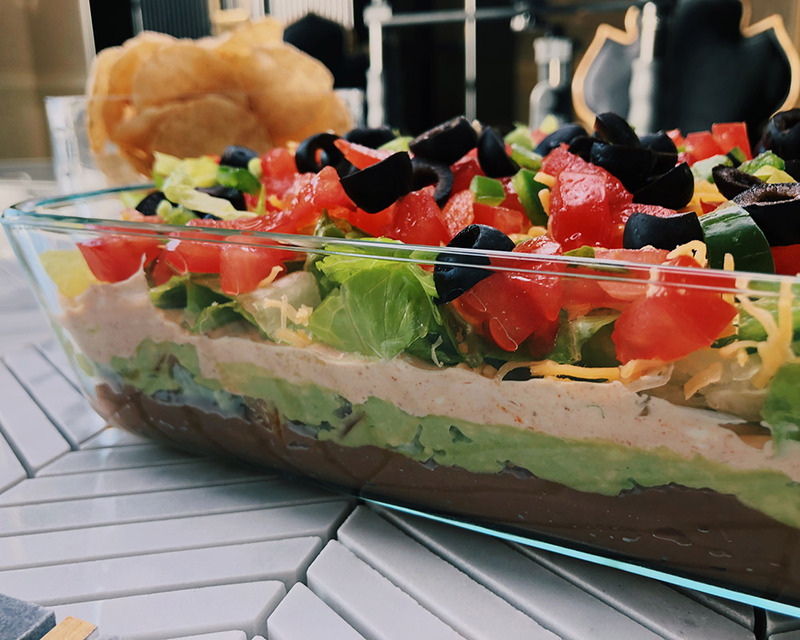 It’s my own little twist on the 7-layer dip everyone loves. I substituted many traditional ingredients with healthier options (bikini season is just around the corner!). Even though this dip is far healthier than any other taco dip, it is still packed full of flavor! 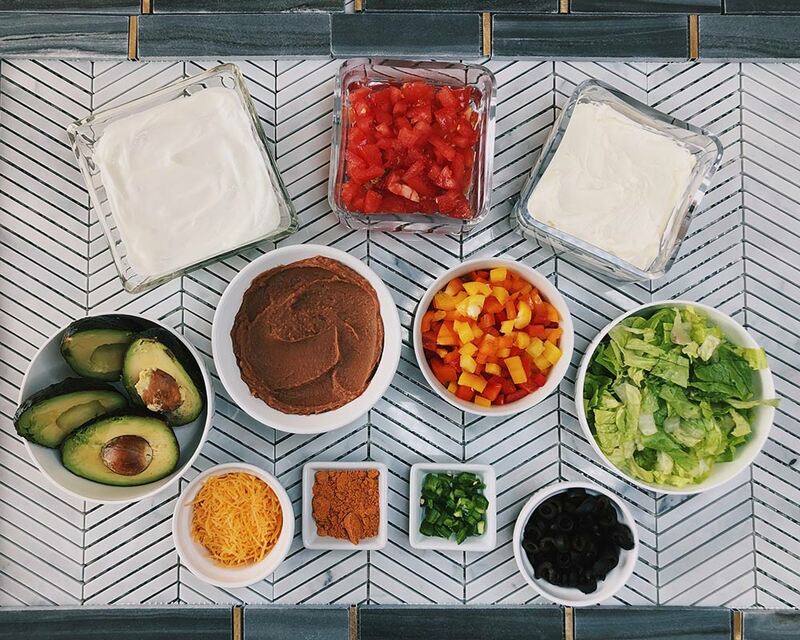 Dips are always my go-to dish when we are having a get-together. They are easy to throw together (my first requirement) and perfect for snacking while socializing (or watching the game if that’s your thing!). Mix the cream cheese and Siggi’s Plain Greek yogurt together in a small bowl (I used a spoon but I would definitely suggest using a mixer… talk about a hand cramp!). Add about half of the taco seasoning (add more if you like more of a kick). Cut the avocados in half and discard the pits. Smash gently with a fork or spoon. Dice up the peppers and add a pinch of salt. Mix together with smashed avocados. Add layer of the avocados/peppers mixture to the refried beans. Next, add layer of cream cheese/yogurt/seasoning mix. Add a layer of chopped Romaine lettuce. Add a layer of diced tomatoes. Add a layer of black olives. Top with a layer of finely cut jalapeños to top it off. Comment below which team you are cheering for! 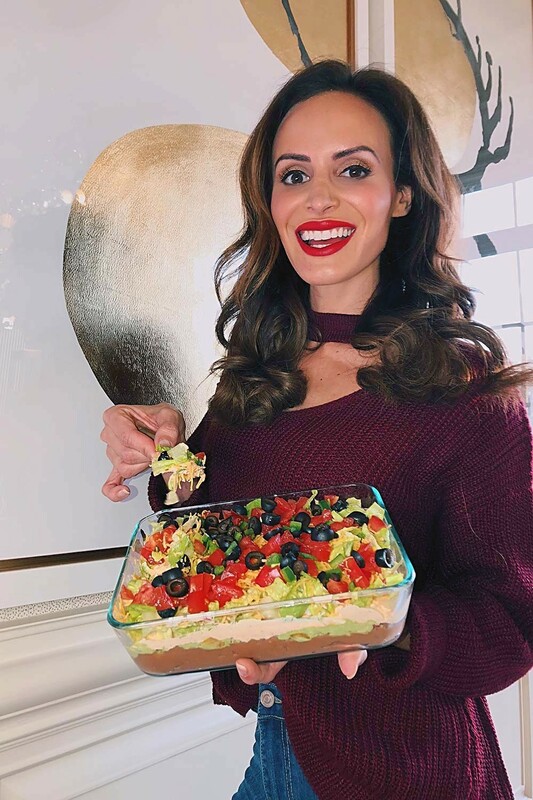 And if you make this recipe, be sure to post a photo and tag me, I’d love to see what you guys create for your Super Bowl parties!